I’m officially a working musician! There. I said it. I’ve been sharing my music here on my blog and on YouTube since I was 16. Throughout the years, I’ve performed randomly on cruise ships, festivals, parties and even on TV – not to mention all that love song stuff. You can say I’ve been gigging! 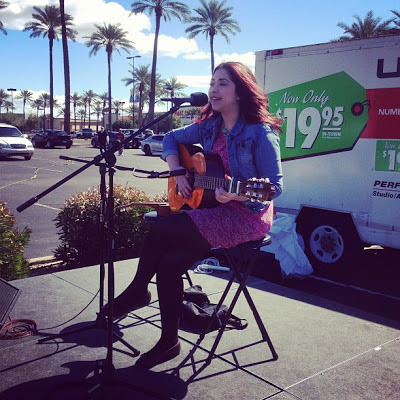 This weekend I played at the Scottsdale Street Fair. I was so excited, I practiced every night, put my song list together, even planned my outfit days in advance. And then the day came and – it was such freezing and windy conditions. Did I mention I was wearing a short FLOWY dress (thank god for black leggings!). As I watched the sound guy set up my microphones, a part of me wanted to run to the store and buy pants..but it was too late. I had to make do. I started my set and it was so blustery that not only was my voice coming through the speakers, but the wind too! Between worrying about my dress flying up, remembering my lyrics and singing through chattering teeth, I loved every second of it. I love singing and performing and am ready and willing to take the good with the not-so-comfy. The whole point of this is that I did it! And I feel really proud about that! Throughout the past few years I’ve played from super-excited crowds to bored-to-death-stare crowds. I even played a gig last summer to hundreds of people…and what happened? My speaker blew out. I had to practically scream every song. But I stayed professional and got through it. Haha. Recently I was interviewed on CBS Legends Radio(i’m at the 23:00 mark) and they asked me what advice I have for young musicians. I still have SO MUCH to learn and experience…but here’s my advice to anyone with a dream (in general, not just music). 1. Get out there. Practice. Post videos. 3. Stop calling your passion a hobby or a dream, make it your mission! In all seriousness, I know it’s scary but it’ll be worth it. The more you practice, the better you’ll be. You have to fail to succeed. If you’re passionate about something, don’t be shy about it. Go for it!! Here’s my question for you. What is YOUR hobby you’d like to turn into a job?